So...your car won't start. Now what? If this has never happened to you then it is likely only a matter of time before it will. You need to know what to do when it happens and the likely causes. I deal with this type of problem all the time and there are usually only a couple of things that cause it. Let's take a look. If your vehicle won't start then there is a chance that you would just need a jump start, but before you try that you should verify that your "security" light is not flashing. If it is then your problem probably does not have anything to do with the battery or starter, it is most likely because your security system is not letting it start. If this is the case then you need to read your owners manual to see how to fix this or contact your dealer. Since all makes and models are different there is no universal way to turn off the security system. If the security light is NOT flashing then you need to start checking the other things that can cause a no start. To troubleshoot, repair and maintain your vehicle, you'll need diagnostic and repair information that is specific to your car or truck. For this I personally use and recommendALLDATAdiy. With full manuals for over 30,000 vehicles online, you will find an exact match for your vehicle's year, make and model. If your car will not turn over (make noise and do what it usually does right before it starts) then there are several things to check. The first thing to check is your battery. There are several ways to do this. The best way is to have it load tested. Most auto parts stores and many repair shops will do this for free. This test is the MOST reliable test to see if your battery is good or not. If you can't or don't want to do this test, you can try turning on all your accessories (heater, radio, lights, etc.). After they are all on, go out and see how bright the lights are. If they are dim this tells you that the battery is probably not as strong as it should be. Another good test requires a multimeter (also called a DVOM). These are cheap (under $20) and you can use it to run lots of diagnostics on your car. After you have your meter, check the battery voltage to see how many volts it has with none of your accessories on and your key off. It should have a MINIMUM OF 12.4 VOLTS. Many people think that a fully charged battery should have 12 volts, but a fully charged battery should actually have approximately 12.6 volts. The battery is the most common cause if your car won't start. The next most common cause is the battery cables not being tight or they are too corroded. This is an easy thing to check...just try to wiggle them. If they move, then they are too loose. Also look for white or blue buildup on the connections. This is an indication that the cables are corroded. 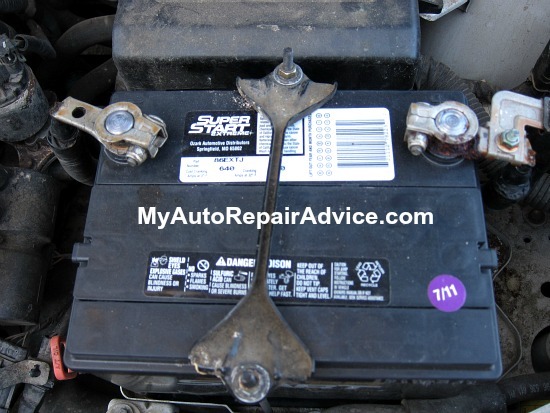 If your battery is good, the next most common cause if your car won't start is the starter. Many times when the starter starts going out you will hear clicking noises from your engine compartment and sometimes it will take more than one try to get your car to start. If your battery is bad it can cause these same symptoms as well so be sure to check your battery FIRST. The best way to test your starter (If you have already tested your battery) is to put the multimeter leads on your battery and have someone try to start the vehicle. Read the voltage at this time. If the voltage drops below 9.6 volts then it is likely that your starter is faulty. If you are having starting problems it is possible that your ignition switch is going bad, but it is very unlikely as they do not go bad very often. This can be diagnosed fairly quickly at most good auto repair shops, but is more difficult for the home mechanic. Fuel pressure, camshaft sensor, crankshaft sensor, ignition problems, etc. 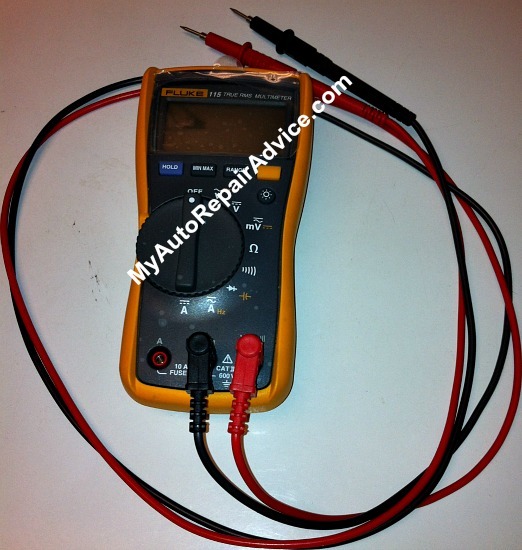 Testing these components can get very technical so my recommendation is to take your car to a good repair shop. Many times people just start replacing parts, and end up spending a lot more money that it would have taken them to just take it to a professional to have it diagnosed. If your car will crank (turn over) but not start then it COULD be just a sensor problem. The camshaft sensor or crankshaft sensor. These sensors give the computer the information it needs to calculate ignition timing, the amount of fuel needed, etc. so if these sensors are not working it can cause your car not to start. If your car won't start it is VERY UNLIKELY that there is any major damage. It is possible that there is internal engine damage, but it is very rare. If you suspect that there is you should take your car to a reputable repair shop to have it diagnosed because you want to BE SURE that there is damage before you have to spend a lot of money to have it fixed.